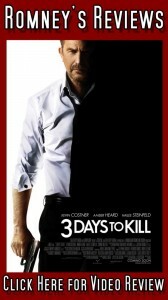 Many people have “3 Days to Kill” pegged as a desperate knock-off of the successful “Taken” franchise. That assumption is partially true and you may be surprised to learn that this film was in fact written by “Taken” director, Luc Besson. While the similarities are uncanny, this particular film also shares some similarities to a few other movies you might have seen both in recent history and during the 90s. So I’ll start this review by dispelling one notion I had – this isn’t an action film. Kevin Costner stars as a retired CIA operative that is dying from cancer. During his last few months he decides to reconnect with his estranged wife and teenage daughter, played by Connie Nielsen and Hailee Steinfeld respectively. Before he can begin to make up for lost time he runs into a CIA operative, played by Amber Heard, who presents him with one last mission to finish in exchange for an experimental drug that can cure his illness. This leads to an awkward mix of “Taken” and “Red 2,” as the operative must balance his work as an agent with his responsibilities to his daughter. The story had potential, but it desperately needed to go through another rewrite. There were quite a few elements that needed to be altered if not outright cut from the film. Another problem I had was its tone. The film would try to play things straight with the action bits, and while the humor added a nice touch, the film couldn’t successfully balance the dramatic scenes and action scenes very well. This is not helped by the fact that director McG was too reliant on the use of montages for scenes where it wasn’t warranted. Even as an action film, the action itself was mediocre, as it didn’t really carry any weight to the overall story. Not to mention that the film also introduces ideas to increase the tension, but never really does anything with them. This felt like the kind of film that would come about if a foreign executive spent three days in a locked room with nothing but spy films and family dramas from the 90s, and then decided to make a movie that was an unholy hybrid of the two. It feels like a hastily produced mish-mash just to make a quick buck. Overall, “3 Days to Kill” comes across as merely a monument to wasted potential. Had the film been given to another director, or was directed by Besson himself, it might have stood a chance. As is, it’s not worth the full ticket price. See it in a dollar theater, or stream it on Netflix if you’re desperate to get your dose of Costner. Better yet, just wait until April. “3 Days to Kill” gets a 2.5/5.